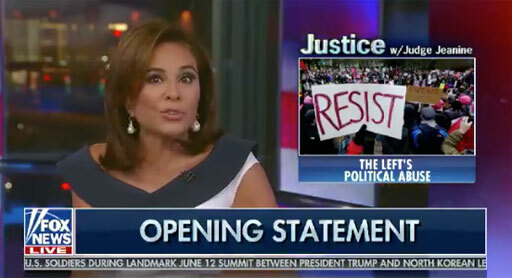 The Randy Report: Irony: Fox News' Jeanine Pirro "Leftists Are Normalizing Outrageous Behavior"
Irony: Fox News' Jeanine Pirro "Leftists Are Normalizing Outrageous Behavior"
On her Fox News show last night, Jeanine Pirro railed about "unhinged leftists" who are "normalizing outrageous behavior" regarding the story of White House press secretary Sarah Huckabee Sanders being asked to leave a restaurant due to the owner's deeply held moral convictions. “Political debate at the very heart of the founding of this country has devolved into political harassment and outright political abuse. Sarah Huckabee Sanders, the White House press secretary, one of the most of prestigious jobs in Washington, D.C., out to dinner, places her order and is then told to leave by the owner because she works for the president of the United States. Sarah quietly leaves. Of course, what's hysterical is Pirro is one of the most fervent supporters of the king of 'normalizing outrageous behavior,' Donald Trump. Pirro being offended by a restaurant owner quietly asking Sanders to leave when the Trumpster has spent years saying every kind of offensive thing he can think of about his political opponents is truly laughable. I thought Republicans had decided that businesses are allowed to discriminate and don’t have to serve people they don’t want to serve. Or is that just for gay couples who want wedding cakes baked for them? Watch the opening rant below.